Those big 1970s vans were like a personal bus. I was a much smaller human back then so it made them seem even larger. I think I could park my current car inside one of them. Also, if you have an iPad I have a bunch of new books available in the iBookstore including a free copy of Maximumble #1! 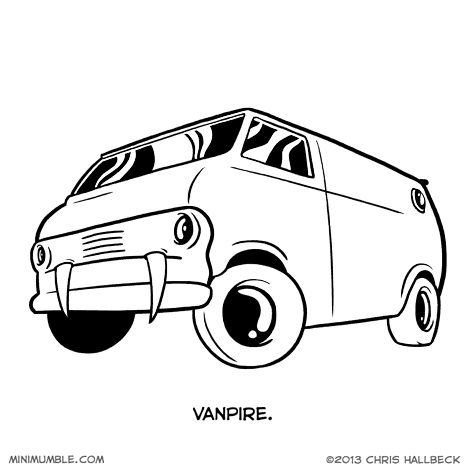 Vanpires feed off the transmission fluid of other autos, turning them into vanpires themselves. Killing a vanpire is no easy task, and can only be done safely during the day while it is parked. The trick is to first drive a stake through its tires, then put holy water in the gas tank. If killing proves too difficult, as a safer option you can just repel vanpires (and generally everyone else) by hanging garlic from your rearview mirror. I remember learning to drive on one of those. The first time I backed it out of a parking spot it was like those cartoons where the back of the boat grows further and further away while you’re looking at it. There was a very short-lived kids ahow called VanPires in the late 90s. I like this one better. Every time I see a van mural, I have this horrible seventies flashback. At least most of them don’t sparkle in sunlight. That would make me angry, and you wouldn’t like me when I’m angry. Trust me on this.